DONALD TRUMP’S NATIONAL security advisor Michael Flynn has resigned amid controversy over his contacts with the Russian government, a stunning first departure from the new president’s inner circle less than a month after his inauguration. The White House said Trump had accepted Flynn’s resignation amid allegations the retired three star general discussed US sanctions strategy with Russia’s ambassador Sergey Kislyak before taking office. The White House said Trump has named retired lieutenant-general Joseph Kellogg, who was serving as a director on the Joint Chiefs of Staff, to be interim national security advisor. Flynn’s resignation so early in an American administration is unprecedented, and comes after details of his calls with the Russian diplomat were made public — upping the pressure on Trump to take action. Several US media outlets on Monday reported that top Trump advisors were warned about Flynn’s contacts with the Russians early this year. 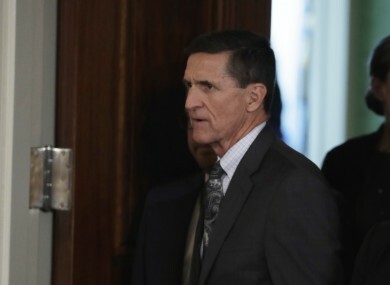 US media reported that the Justice Department had warned the White House that Flynn had misled senior administration officials about the contents of his talks with Kislyak, and that it could make him vulnerable to Russian blackmail. The message was delivered in the last days of Barack Obama’s administration by then-acting attorney general Sally Yates — who Trump sacked after she instructed Justice Department lawyers not to defend his contested travel ban. In the hours before his resignation, some Trump aides suggested that Flynn had the full support of the president. That was a sharp break with the Obama administration, which introduced a wave of sanctions against Moscow over its annexation of Ukraine’s Crimea, support for separatists in eastern Ukraine and what US intelligence says were its attempts to sway the 2016 election in Trump’s favor. “It is his duty to be fully transparent and forthright in his actions — anything less is unacceptable,” Representative Mike Coffman, a Colorado Republican, said in a statement. Email “Trump's national security adviser quits after claims he misled White House over talks with Russians”. Feedback on “Trump's national security adviser quits after claims he misled White House over talks with Russians”.